The first thing I noticed during my afternoon spent visiting Stockholm’s churches of the 1600’s was that the earlier churches (Clara Kyrka 1577, Maria Magdalena Kyrka 1588, and St. Jacob’s Kyrka 1588) and the later churches (Katarina Kyrka 1656, Hedvig Eleonora Kyrka 1658, and Kungsholmen Kyrka 1672) were designed very differently. The earlier churches all had a traditional plan with a long nave and the alter at the east end of the church. Some of these earlier churches also had crossings, or transepts, making the churches cross-shaped in plan. However, the later churches were all symmetrical about their center points, and the plans were focused more toward the center of the church than at the alter. When I got home, I looked at city maps to confirm that what I had noticed about the differing plans was true, and I found that my observation was correct. 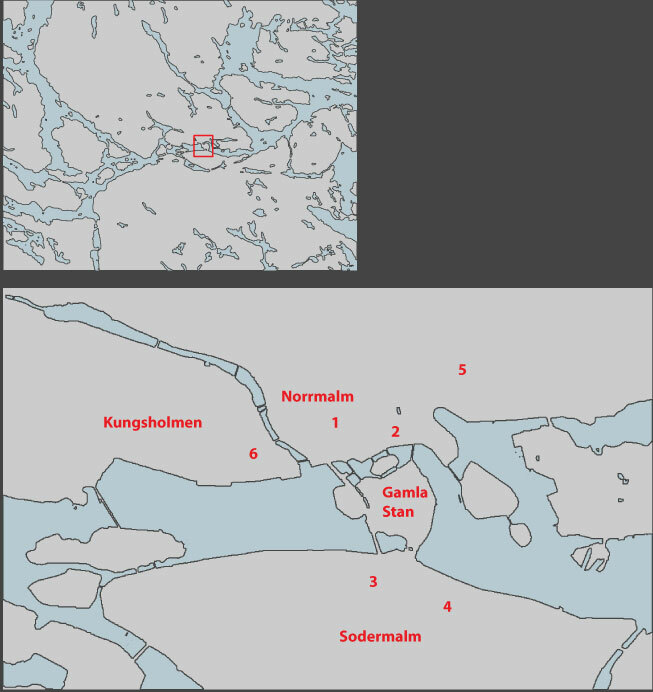 I also noticed something else on the maps that I found intriguing: the churches that were started before 1630 are on the traditional east-west axis, but the churches that were started after 1630 and after Örnehufvud’s city plan was implemented are on axis with the street grid instead. Churches were traditionally oriented east-west so that the alter would face the rising sun (or rising son), and this tradition holds true throughout the centuries, throughout the changing architectural styles, and throughout the continent. But after the implementation of Örnehufvud’s city plan, this tradition was abandoned in Stockholm; instead of orienting churches to the rising sun, architects now oriented Stockholm’s churches to the city itself. And since the entire city was arranged to radiate outward from the king's castle, the churches were now more oriented toward the king than toward the risen son of god. 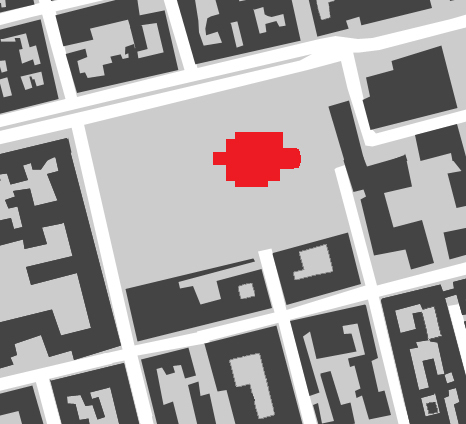 When laying out his street grid, Örnehufvud worked around existing churches. He identified locations where new churches would be located when the surrounding neighborhoods were built-up enough to require a new parish. These churches were given generous yards which encompass two to four city blocks, giving each neighborhood a bit of open green space. 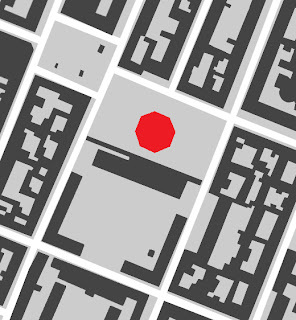 Örnehufvud meant for these new churches to be orienting landmarks within the ever-increasing density of the city. 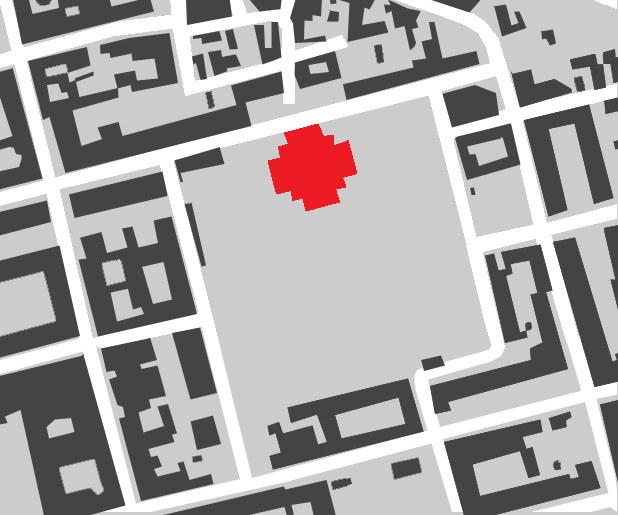 Usually, the church is located on axis with streets that dead-end into the church block. These dead-end streets provide clear visual access to the orienting church spires. While the churchyards provide a green relief from the cityscape, they function as cemeteries with gravesites throughout the yard. Many of the churches I visited also had a series of family tombs built into a thickened wall around part of the churchyard. Other buildings also abutted the churchyard walls, usually including a parsonage and sometimes other ancillary buildings such as a school or hospital. Not only were churches now oriented to the city instead of the rising sun, but they were also oriented inward, toward the congregation, and not outward, toward the world. The traditional cross-shaped plans had a trajectory: they encouraged you to walk down the long nave toward the alter, and even the rituals of worship took advantage of the nave as the priests, choirs, brides, and alter boys processed up and down the naves. I haven’t done much research into this, but the newer, symmetrical plans must have been related to Sweden’s bourgeoning Lutheranism which became the official state religion in 1593. Lutherans believed that a priest wasn’t needed as an intermediary between man and god; instead, man could communicate with god by himself. The priest was no longer semi-divine and became human again, stepping down from the high alter. Religious life was no longer a hierarchy with the priest on top, instead, importance was placed on each individual and on the congregation as a whole. Likewise, as the role of regular people became more important within religious life, focus inside the church turned from the priest toward the congregation itself, resulting in symmetrical plans with a focus toward the center of the church. In addition to the new types of building plans, the architectural styles of the churches changed with the new religious era. An influx of foreign, continent-based architects influenced design away from the late-gothic and Northern European Renaissance styles of the 16th century and refocused design toward a more restrained Dutch Palladianism. As King Gustav I became more and more anti-Catholic, priests and monks (along with those who were loyal to the Danish) fled the city to take sanctuary in the churches and monasteries surrounding Stockholm, taking valuables from the city churches with them. A dangerous concentration of the King’s detractors was building up just outside the city. Now that the war with the Danes had been won, Gustav wanted to rebuild the parts of the city that had been obliterated during the battles. In a two birds, one stone maneuver, he passed an Act of Parliament in 1527 which proclaimed that all churches and monasteries in the Stockholm suburbs would be demolished, and their bricks and stones would be transported into Stockholm to rebuild the city and reinforce the castle’s defenses. It is with these bricks that Clara Kyrka (map 1, 1577) was built on the mainland just north of Gamla Stan, replacing a 1289 monastery that had fallen into ruin before the Danish wars. The interior was rebuilt after a fire in 1751, and the spire was rebuilt several times, most recently in the 1880’s. However, it is still possible to see the late-Gothic rib vaults and the pointed-arch windows as well as the traditional east-facing nave. 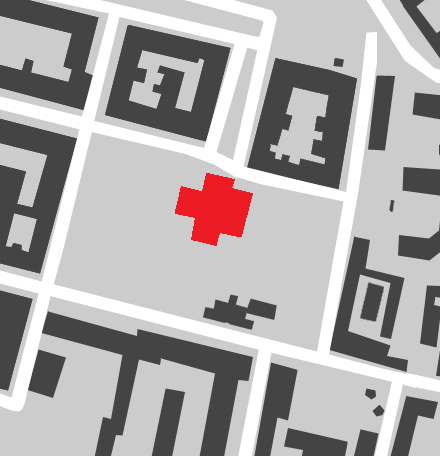 St. Jacob’s Kyrka (map 2, 1588) was originally located in Solna, a town just to the west of Stockholm. This church was destroyed due to the 1527 Act of Parliament, and its stones were moved inside the city to the site of a ruined burial chapel a few blocks from Clara Kyrka. Willem Boy was probably the architect. The interior consists of a nave with two side aisles separated from the main aisle by chunky stone columns. The late-Gothic style is evidenced by the pointed-arch rib vaults and windows, however, the transition to Renaissance styles is indicated by the rounded arches separating the roof vaults. The current tower was built in 1739, replacing a tower destroyed by fire. On Södermalm, Maria Magdalena Kyrka (map 3, 1588) also replaced an older church. Nothing about this church is Gothic; both the nave vault and the window arches are rounded, giving the church a more Renaissance flavor. This church contains a traditional nave but no side aisles. I haven’t found much information about the way the church originally looked, but it seems to have been renovated by both Nicodemus Tessin the Elder and Younger. I’m deducing that it was they who plastered the church and gave the north and south transepts Palladio-inspired facades with pilasters and tympanums. While the three above churches were all begun in the last half of the 1500’s, none of them were finished until the mid-1600’s. Between 1635 and 1685, Stockholm’s population quadrupled, reaching 60,000 inhabitants. 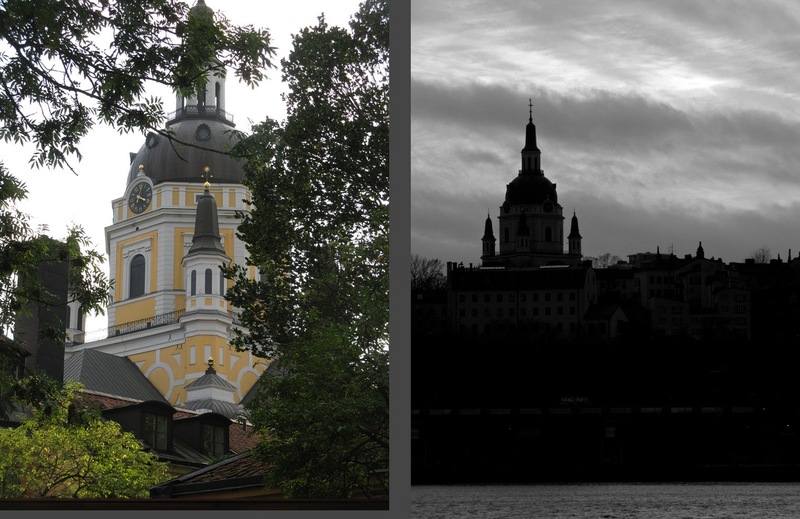 Soon after the above churches were complete, the city of Stockholm had grown enough to require a new group of parish churches. In contrast to the Clara, St. Jacob’s, and Maria Magdalena churches described above, Katarina Kyrka (map 4, 1656) is a Greek cross in plan, meaning that all 4 arms of the cross are equal in length. This symmetrical plan is not meant for processionals and pageantry; indeed, the interior of the church is quite unadorned. Pews in three of the cross arms face each other, and more pews occupy the center of the church. One arm of the cross contains an alter, but this seems a secondary focus compared with the huge chandelier and oculus in the center of the church. However, Jean de la Vallee’s (King Carl X’s chief architect) original plan called for the alter and pulpit to be located in the center of the church. This arrangement had been approved by the king, but after his death, the parish protested and King Carl XI intervened to move the alter to the eastern arm of the cross. The churchyard surrounding Katarina Kyrka is especially large. 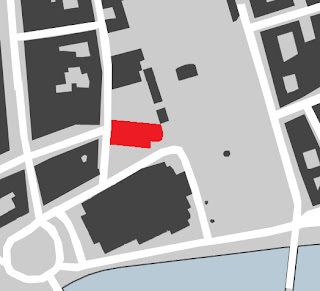 There is evidence that King Carl X intended to move his administration center to this site and that he intended to replace the Tre Kroner Castle on this site as well. For these reasons, he wished for a particularly impressive church, and he demanded that the church should be continental in style, befitting of the monarch of a new European superpower. Katarina Kyrka has had a particularly tumultuous history. In 1520, Christian II of Denmark invaded and captured Stockholm. Immediately following a banquet celebrating his victory, Christian II invited Sweden’s nobles to a private meeting and assured their safety. Instead of discussing the nation’s future, Christian II had 80 of Sweden’s highest-ranking nobles executed. The victims of the Stockholm Bloodbath were buried at a cemetery just south of town; Katarina Kyrka was built on the site of this cemetery. One hundred and fifty years later, 300 women were tried for witchcraft in the church. Based on the fabricated testimony of children, these women were found guilty and burned at the stake. In 1723, a fire destroyed the church tower, but it was rebuilt in 1734. It is thought that an electrical fault caused the fire of 1990 which destroyed most of the church. Because the exterior walls and the crossing were intact, it was decided to rebuild the church using the original methods of the 1600’s. This included hand-forged nails, hand-hewn roof timbers, hand-moulded brick in original dimensions, and the use of birch bark as a long-lasting moisture barrier between the timbers and the plaster. Hedvig Eleonora Kyrka (map 5, 1658) was also designed by Jean de la Vallee, though it wasn’t finished for 75 years and the completing architect, GJ Adelcrantz, made some alterations to the original drawings. Although the church is octagonal in plan, the main interior space is round, bringing the idea of an inward-focused, symmetrical church to full fruition. While there are some sumptuous details in the church including gilded capitols, marbleized columns, a gold alter, and a continuous entablature around the dome, gray plaster covers most of the interior surfaces making the church feel somber. 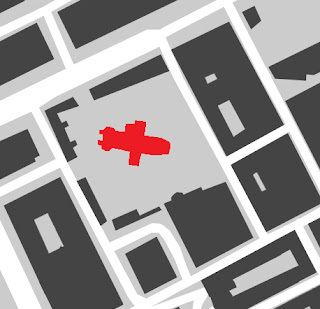 The church was originally connected to the navy, and it shares the four-block site with the historic admiralty buildings. Although it is much smaller in scale, Kungsholmen Kyrka (map 6, 1672) by architect Mathias Spieler is almost identical to Katarina Kyrka in its Greek cross plan and interior ornamentation. Like Hedvig Eleonora Kyrka, funds for the building dried up after the foundations were laid, and there was a pause in construction. Hedvig Eleonora Kyrka seems to have resumed construction with full coffers, but Kungsholmen Kyrka is even more subdued and simplified than the other churches of the period. It is evident that arched windows were originally planned, but probably in a cost-saving measure they were actually built as rectangles, leaving bare plaster to fill the gap between the top of the windows and the arches. Regardless of its modest scale and ornamentation, Kungsholmen Kyrka makes an impression, perhaps because of its large, green site amidst the dense Kungsholmen neighborhood and because of its steeply sloping site. Even though the church tower is relatively low, it looms over the lower half of the neighborhood. Through their evolving architectural styles and their starkly differing plans, these six churches visibly demonstrate shifts in Sweden’s politics and religion. Note: Dates in the above text denote the start of construction. North is up in all maps.